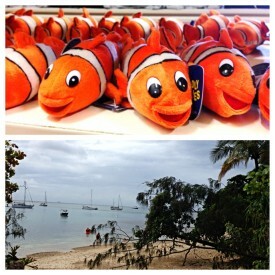 Fitzroy Island Resort opened it's doors in July 2010. 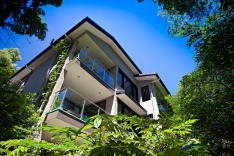 Nestled between the rainforest and beach, this boutique resort has 99 rooms comprising of affordable studios, One & Two Bedroom Apartments and Beach Cabins. The new resort accommodation is designed and built to high standards, and is now affordably priced and targeted at the 4.5 star family and couples market. 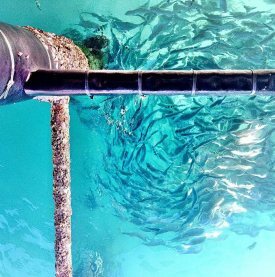 This is the only resort on the island. Facilities are exclusive to resort guests and include a restaurant, a large swimming pool and spa, a swim-up pool bar, conference rooms, indoor and outdoor function space, a cinema, games room and kids play room. 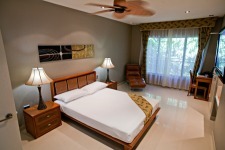 Resort Studio Rooms overlook the rainforest and each feature one King/Queen bed or two King Singles, air conditioning with ceiling fan, plasma TV, en-suite black marble tiled bathroom, tea and coffee facilities, bar fridge. Rooms are 32sqm and have limited views. 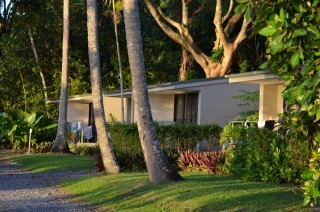 Beachfront Cabins are just a stones throw from waters edge with large balcony. This cabin sleeps a maximum of four guests with a Queen size bed and separate bedroom with twin beds. The generous balcony offers beautiful views across Welcome Bay. 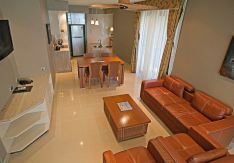 Other facilities include plasma TV, tea and coffee facilities, air conditioning with ceiling fans. 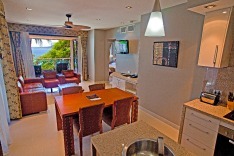 Walk directly from the front balcony onto the coral beach. 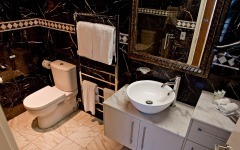 One Bedroom Ocean Suites feature large queen-size master bedrooms, a spacious lounge area, ensuite bathroom with shower, kitchenette, lounge and dining area and private balcony, which are ideally located parallel to the beachfront. Just a cluster of tropical palms shade your view of the magnificent ocean. Sleeps up to 4 guests (extra guests sleep on a sofa bed). 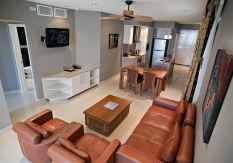 Two Bedroom Ocean Suites are a combination of both the Resort Studio and the Ocean Suites to provide for a two bedroom apartment which is great for families or friends wishing to share accommodation, sleeps up to 6 guests. These rooms are joined via a common external doorway, they are adjacent but not interconnecting and not suitable for young unsupervised children. Sleeps 4 to 6 guests. 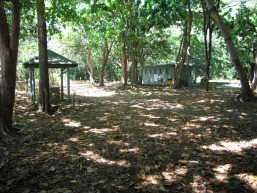 The Fitzroy Island Council Campground is located, next to the beach, only 5 minutes stroll from the Jetty. The campgrounds has approximately 28 tent sites, a modern Ablutions Block, BBQs and pergola cover for eating areas. You will need to supply your own drinking water and food. 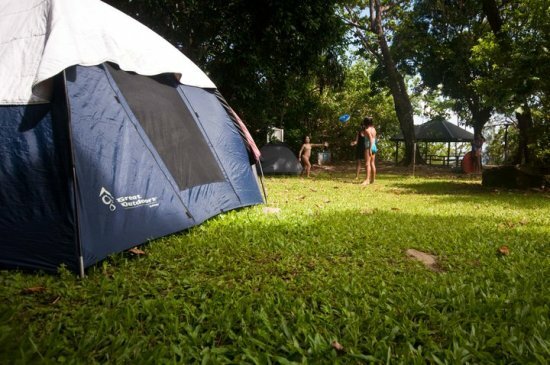 The campgrounds are managed by the Fitzroy Island Resort staff. As sites are limited, bookings are essential. 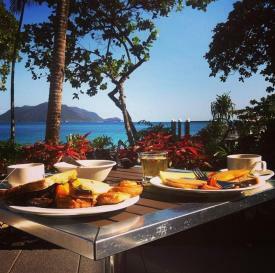 For more information and to reserve your stay, contact Fitzroy Island Resort on (07) 4044 6700 or email stay@fitzroyisland.com. 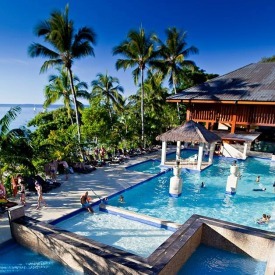 The resort pool features a magnificent swim up bar where you can relax in the sunshine with your favourite wine, beer or cocktail, or sample some bubbles in the spa. 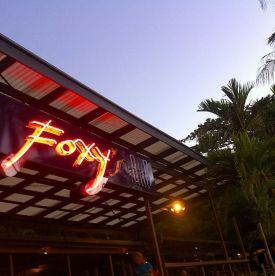 Foxy's is a large Pacific Islands bar with a 70s structural theming, situated right on the beach front, about 100 metres from the resort buildings, south of the main creek (on the way to Nudey Beach). Foxy's has an excellent casual cafe style food menu and provides a wide range of food and drink options including kids meals and coffee. Foxys opens late on the weekend with live entertainment and also features a committee meeting room available for sporting clubs. 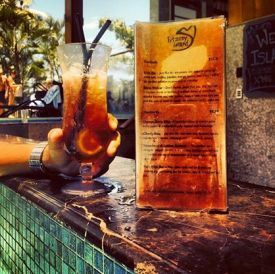 The General Store is adjacent to Foxy's and has a range of packaged food, drinks and general needs including pies, sandwiches, ice-creams, BBQ packs, soft drinks and sunblock. Take away beer and wine are available for purchase from Fox's Bar. 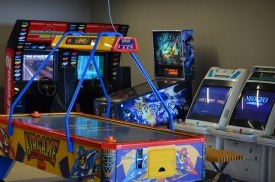 Just in case the kids have had enough of swimming and exploring the island, the games room has a selection of Puzzle Boards, Board Games, Books, old and new favourites for both little and big!